Mr. Holmes is a crime film starring Ian McKellen (The Lord of the Rings trilogy, X-Men Trilogy) as a retired Sherlock Holmes dealing with the decline of his health and mental ability. He looks back at his incredible life, and with the help of Roger, his housekeeper’s son, Holmes seeks closure of an old, unsolved case. Based on the seventh novel by author Mitch Cullin, the film is directed by Bill Condon (Dreamgirls, Fifth Estate) from a screenplay by Jeffrey Hatcher (The Duchess, Casanova). Ian McKellen is supported by Laura Linney (Hyde Park on Hudson), Hattie Morhan (Summer in February), Patrick Kennedy (Warhorse) and the film introduces up and coming actor, Milo Parker. For 5 days in July 2014, the Mr. Holmes production team visited The Historic Dockyard Chatham in Kent, to use Anchor Wharf as a street in Japan. They also dressed the Tarred Yarn Store as a Japanese restaurant and the exterior of the Ropery for a street scene. The Historic Dockyard Chatham has previously been used as a film location by BBC for Call the Midwife (2015), ITV’s Arthur and George (2015) and Les Miserables (2013). 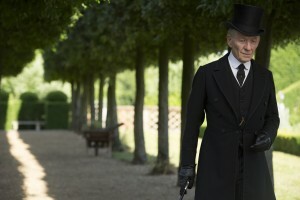 Don’t miss Mr. Holmes was released in cinemas on Friday 19th June 2015 and is now available for DVD and online purchase. This entry was posted in Filmed in Kent and tagged Arthur Conan Doyle, feature film, Ian McKellen, Mr. Holmes film location, The Historic Dockyard Chatham. Bookmark the permalink.